We are here to help you look and feel great with confidence-boosting treatments. Our expert team is highly skilled in a diverse range of innovative therapies including facial aesthetics, laser hair removal and advanced procedures to target specific skin concerns. You can be certain of a warm welcome and personal approach that always puts you first. Does your skin feel sensitive or irritated after shaving, waxing or plucking? Worried about the signs of ageing or tired of looking tired? 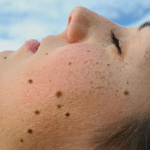 Acne affects thousands of people in the UK, are you one of them? Do these conditions affect your confidence and self-esteem? If so, then book your consultation with our specialists now…! Simply fill in the form below or call us on 01753 885777. The Deluxe Clinic team is highly experienced and qualified. We have a wealth of expertise in aesthetic treatments and therapies and are committed to the very highest service standards. 🌹🌹🌹🌹HAPPY MOTHERS DAY 🌹🌹🌹🌹.Doesn’t matter skin or hair colour, 👠 size or clothes size, you are all beautiful 🤗. *Results may vary and are different for each individual. As such, Deluxe Clinic cannot guarantee specific results. ©Copyright Deluxe Clinic. All rights reserved.